As an artist, Laura Escudé’s output as Alluxe fuses avant-garde and classical elements with live electronica to create a unique, hybrid style of electronic music. Using custom controllers, vocals and violin, she seamlessly blends original compositions, improvised beats and instrumental loops. Escudé’s production skills have earned her remix commissions from M83, Polica and Mr. Hudson, and her violin playing and string arrangements can be heard on albums by Kanye West, Jay Z, and many others. In our latest One Thing video she shares a great technique for generating new musical ideas by randomizing effects. Besides her own musical projects, Laura’s work involves programming and designing live shows for the likes of Drake, Bon Iver, The Weekend, Cirque du Soleil, Herbie Hancock and others. 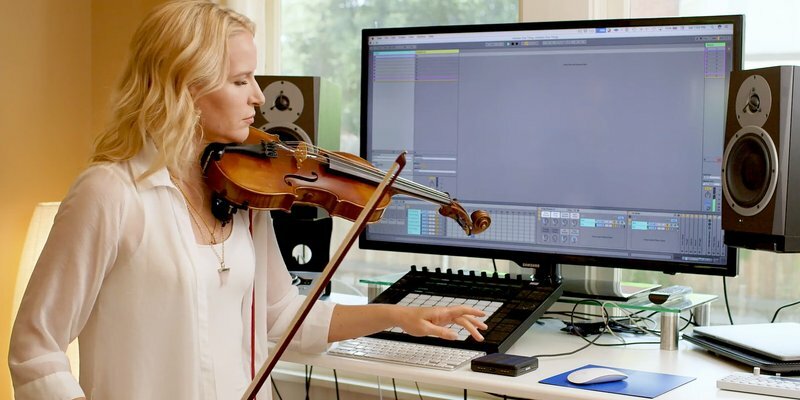 Escudé was also the world’s first Ableton Certified Trainer in 2008, and in the behind the scenes video below, she expertly demonstrates her method of creating music and shows how she records and resamples her violin in various stages, including using Push to create new song ideas. You can also download the Live Set* Laura uses in her One Thing video for free from her website (sign-up required). The Max for Live device Laura uses in her video is one of a number of useful tools made by Tom Cosm, an Ableton Certified Trainer based in Australia. He’s made the whole set of 28 Max for Live devices available as a free / name your price download.